Hides the player marker, location icons, and locations names on the map screen, for those who would like to make navigation more interesting and challenging. 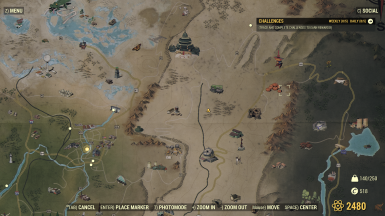 This mod hides the player marker, location icons, and locations names on the map screen, for those who would like to make navigation more interesting and challenging. I made this mod in preparation for the upcoming survival mode, where fast travel will be disabled, and thus manual navigation will become much more important. For best results, this mod can be combined with an alternate map texture mod, such as those I've uploaded here: Blank Map mod. You can also disable the compass: Simply go to Fallout76Prefs.ini, find bShowCompass=1 under the [Interface] header, and change it to bShowCompass=0. If anyone would like a version with some of these icons disabled as well, or some currently hidden icons visible again, let me know and I may be able to create one. Place GetLost.ba2 into your Fallout76/Data folder. Please report any bugs you find! I don't expect anything major, but I haven't done any long-term testing yet.